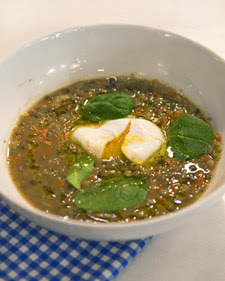 I'm addicted to Mezza's Turkish Lentil soup. I could eat this everyday for lunch. 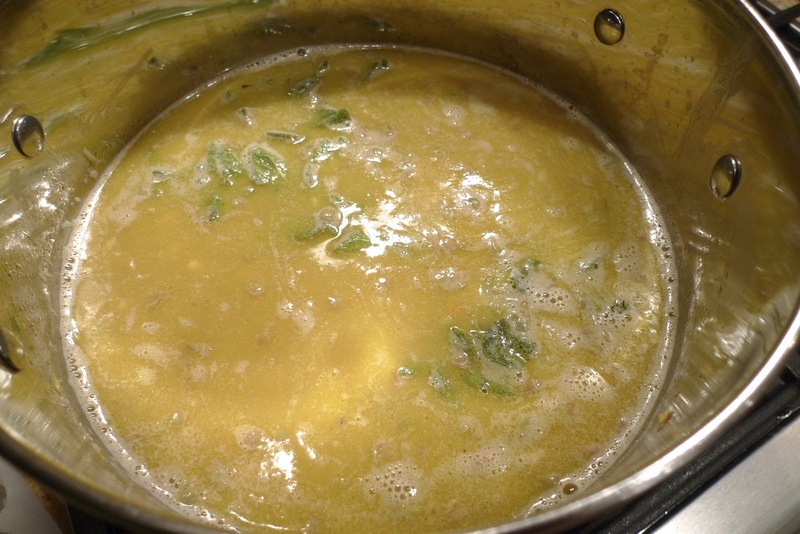 It's a creamy and luscious soup with tons of great flavor. I have yet to figure out what goes into this dish but when one of my friends lost her appetite and had strong aversions to certain foods, I thought this would be the perfect soup to make for her. I found this recipe on Ms. Martha's website and thought it might be good to try. Here are the veggies I used. The recipe calls for celeriac, which is also known as celery root, but I couldn't find it readily so I just omitted it. I used celery, carrots, onions and leeks. 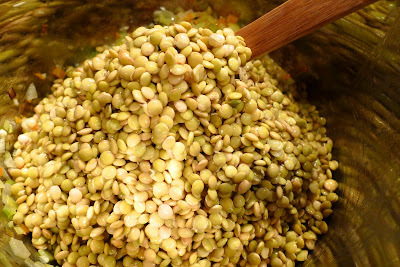 Place lentils in a large bowl. I couldn't find green lentils so I used brown lentils. Add 2 1/2 cups water; soak for 12 hours. 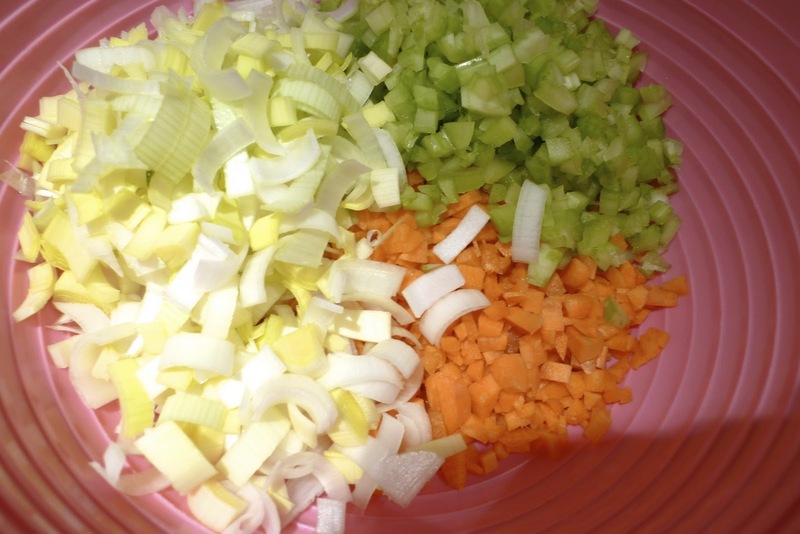 There's a lot of prep work that needs to be done with the veggies so I suggest cleaning and chopping up all your vegetables at the beginning. Melt 6 tablespoons butter in a large Dutch oven over medium heat. 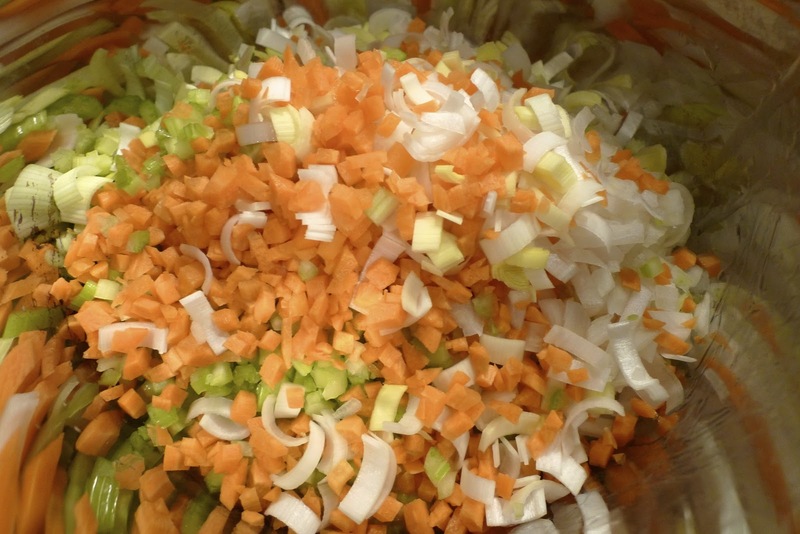 Add carrots, onion, celeriac, leeks, and celery. 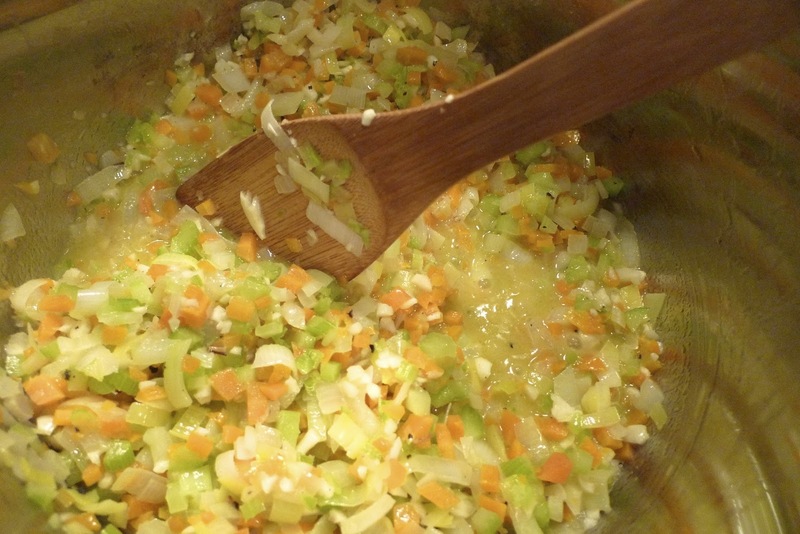 Cook, stirring, until vegetables have softened and onions are translucent, 2 to 3 minutes. Drain and rinse lentils; add to Dutch oven. Cook, stirring to combine, 2 to 3 minutes. Place thyme, garlic, and peppercorns in a piece of cheesecloth; tie with kitchen twine to enclose. I didn't have cheesecloth so I just added thyme, garlic and ground pepper into the soup directly. Add to skillet along with chicken stock. Place a parchment paper round over liquid and cook for 10 minutes. 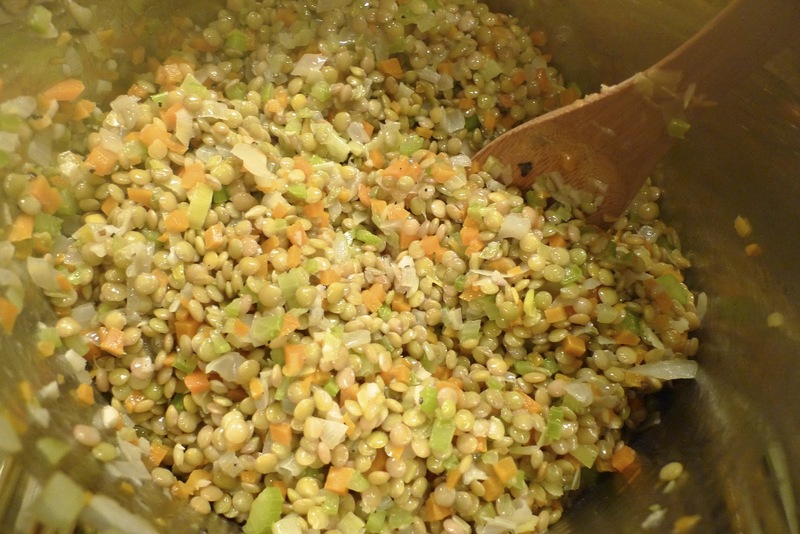 Season with salt and continue cooking until lentils are tender, about 5 minutes more. Transfer 1/3 of the soup mixture to the jar of a blender; blend until smooth, adding chicken stock, if necessary. Transfer blended soup back into Dutch-oven with remaining soup; stir to combine. Add spinach leaves, remaining 2 tablespoons butter, and drizzle with olive oil. Keep warm. 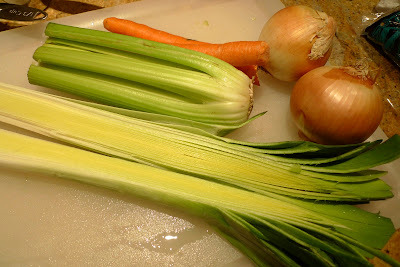 In a separate pot, fill it with water and add vinegar; bring to a boil over medium-high heat. Gently crack eggs into pot, one at a time, and reduce heat to medium. Cook eggs for 3 minutes; using a slotted spoon, transfer cooked eggs to a paper towel-lined plate. Serve soup immediately topped with a poached egg. I forgot to take more pictures, but here's a picture from Martha's website, showing you the finished product. I really liked this soup but there is an obscene amount of butter in this dish. I think it is tasty without all that butter so I'd adjust it a bit on the next go around. I'm definitely going to be experimenting with more soups this winter so I'll keep you posted.